Metro’s operations committee is expected to approve all-door boarding for the Silver Line BRT this week. 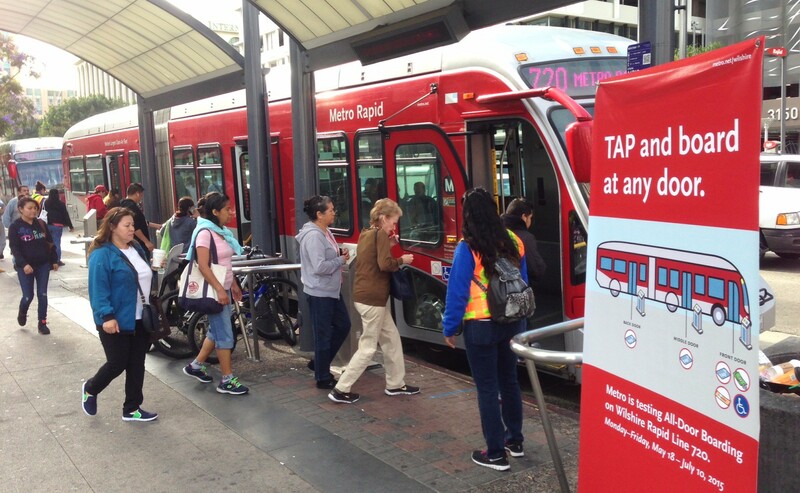 Photo of the agency’s 2015 Wilshire all-door boarding pilot: Joe Linton/Streetsblog L.A. This week’s big Metro announcement, expected Friday, will be the fall ballot measure expenditure plan. Some early Measure R2.1 outlines are already foreshadowed here and at the Los Angeles Times. That expenditure plan will be huge news, but there is other important Metro business going on at Metro board committee meetings this week. Dollar for dollar, this week’s committee business may not match the budget for the November ballot measure, but, from ciclovías to bike-share to all-door boarding to parking to joint development, these agency decisions can add up to make a difference for the region’s livability. The committee is expected to authorize an all-paid parking pilot for nine rail stations. This is an excellent step to stop costly-to-provide free parking from hemorraging away Metro’s budget, and for managing parking to better foster equity, improve air quality, and encourage active transportation. The committee will hear a proposal to discount Metro bike-share fares for low-income folks, seniors, and students. This should be one helpful step toward making bike-share service more equitable. More details here. Metro is proposing to fund CicLAvia-type open streets events, similar to the agency’s prior open streets funding cycle. The overall allocation would be $4 million, with $2 million per year for Fiscal Years 2017 and 2018. The committee will consider joint development plans for parcels at First Street and Soto Street in Boyle Heights, and at Fourth Street and Hill Street in Downtown L.A. (rendering below). Additional committee items include the Union Station run-through tracks (called the Southern California Regional Interconnector Project or SCRIP), double-tracking a portion of Metrolink’s San Bernardino line, and evaluating a proposed Metrolink Station for Rio Hondo College. The Construction Committee has a relatively short agenda, including expenditures for Union Station’s Patsouras Bus Plaza, the nearly completed Universal City pedestrian bridge, and highway soundwalls. The budget for the Universal bridge, not SBLA’s favorite project, has ballooned from an initial $19 million to $30 million. 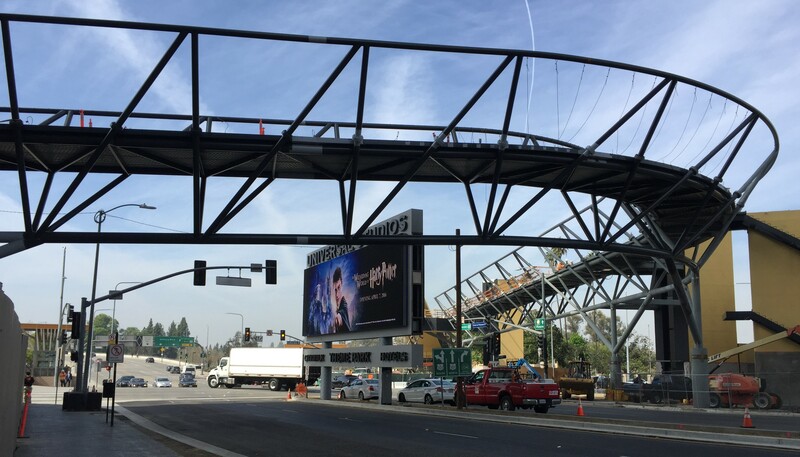 The formerly $19M Universal City Pedestrian Bridge now costs $30M. Photo: Joe Linton/Streetsblog L.A. 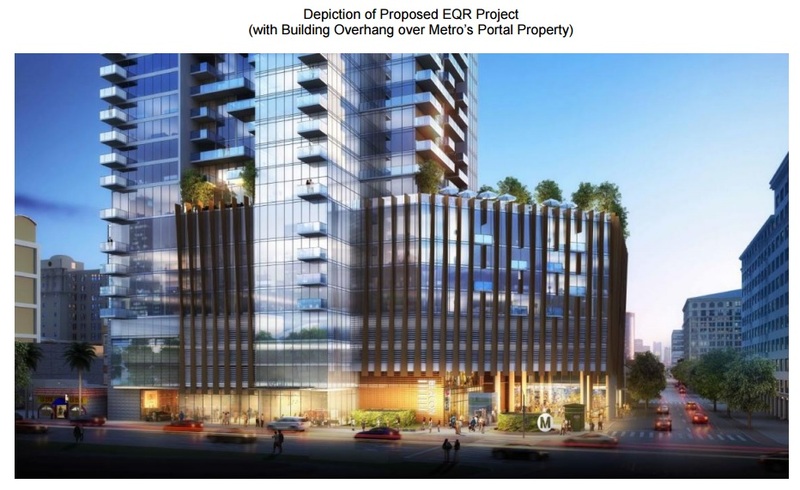 The committee will receive a report [PDF] on the success of the Wilshire all-door boarding pilot, and will vote on authorizing all-door boarding for the Silver Line BRT. The operations committee is also expected to approve contracts for additional bus operator shield barriers, ExpressLanes consultants, and an emergency security operations center. The management committee has a relatively short agenda, which includes positions on state and federal legislation, audits, and preliminary FY2017 budget updates. Streetsblog will be at these meetings, tweeting updates. All these issues and more will bubble up into the full Metro board meeting next week. That takes place at 9 a.m. on Thursday March 24. The board agenda will be available here. Why doesn’t LA have all-door boarding on every single bus line? That’s a standard for all succesful transit systems. I would understand front door boarding in some village bus lines, but not in metropolis like LA. The simple reason is that there is a high perception of fare evasion. It doesn’t help when you have activists complaining that minority children are getting ticketed on the Metro Rail for going to school, our court system is clogged and congested, or that it is impossible to do POP enforcement on standing room only buses, as can be found on some Metro routes. But if you don’t charge a fare, essentially you are creating roving homeless shelters and other people using the bus for “non-transportation” purposes. Yes, homeless people can be a problem, but with this approach you’ll never have attractive mass transit, because front door boardind repels much more people because buses are slow, then homeless people, who sometimes travel it. SCRIP sounds small, but those run-through tracks are essential for converting Metrolink into something more useful. Does anyone know whether there was any decision made regarding the development above the 4th & Hill portal at Pershing Square Station? It’s true that long travel times turn a lot of people off, but then again so does the presence of homeless folks. I’m not sure where the “sweet spot” lies, but I think piloting all-door boarding on the Silver Line sounds reasonable. But to really speed up non-busway buses, I think dedicated lanes are key. For 2028 Olympics project acceleration to foster equity, don't speed up highway projects. Instead focus on improving the bus system.